This series got its start- and continues to be so much fun for me- as a result of my own search for just the right personal Project Car Hell; I came close to buying the 20R-powered Austin Healey Sprite in the very first PCH, and I've been searching ever since. I considered and rejected the '65 Falcon wagon, and now it looks like my cousin might take on the '68 Torino GT himself. 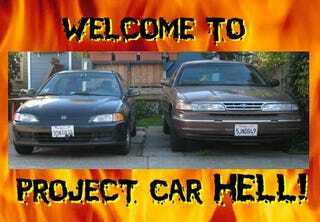 But then I realize that I have two machines with Super Sleeper Potential right under my nose: my daily-driver 1992 Honda Civic DX and 1997 Ford Crown Victoria P71! Why, I could turn either one into a ragin' dragstrip monster with easily-obtained hop-up gear right off the shelf! Gadzooks! The 90s Honda Civic is edging ever closer to Ford Model A and '55-57 Chevy territory when it comes to the sheer number that have been sap-enhanced by wild-eyed hoons looking for crazy acceleration out of a once-sedate transportation car. Sure, most of the Civics you see on the street with 6" diameter tailpipes and Space Shuttle wings would be hard-pressed to buzz out a pathetic 15-second dragstrip pass, but don't be fooled by the foolish antics of the all-show-no-go crowd! Were I to go about upgrading my Civic, it would be done stealth-fashion: don't touch the body, use a quiet muffler, and keep the wheels/tires as stock-looking as I could get away with. I could stick with the D15B7 that's already there and add mild turbocharging... but why do that when I could add a quick 80 horses with a B18C plus ECU, transmission, and accessories, straight from Soichiro's homeland? The B18C isn't a particularly challenging swap into a 5th-gen Civic, so where's the hell? Well, here in California we have über-strict smog laws... and I'd need to make it even harder for my new VTEC setup to pass the test once I bolted on a supercharger. Then, of course, the stock suspension and brakes would need some help, and the list goes on and on. But who cares? Imagine the glorious torque-steering mayhem that would result from tripling the factory horsepower in an already funky-handling front-wheel-drive economy car! A sleeper Civic would indeed be a great deal of fun, but our forefathers didn't invade Grenada so we could drive front-wheel-drive cars! Hell no! Rear-drive V8s colossi rule this land, buddy! My Crown Vic has a nice stiff cop-grade suspension and big brakes, but the 4.6 SOHC V8 leaves something to be desired in the power department. I could do what Quickvic did to his Crown Victoria and nitrous my way to glory... but that wouldn't be difficult enough. What I need to do is pick up this supercharged F-150 Lightning engine and transmission and stuff it into the engine compartment. The fun will be just beginning at that point, since California's smog referees are known to gaze disapprovingly upon truck engines in cars, even if the donor engine retains all its smog gear and is from a newer vehicle than the transplantee. Of course, I'll probably find at that point that the factory one-legger rear end (the San Joaquin County Sheriff's Department apparently didn't feel like spending the extra for limited-slip diffs in their detectives' cars) doesn't quite do the job of applying power to pavement, and (knowing Ford's love of pointless year-to-year hardware changes) getting all the engine accessories to work might be a beat-head-on-wall exercise in frustration. It will all be worth it, however, when I'm rumbling around town with a great big blower sticking through the hood of my Ford... oh, wait- wasn't this supposed to be a sleeper project?